Last year’s Steel City Jazz Festival was a pretty wild ride for me. After all, it was my first time running the festival and we packed ten amazing shows into just four days. At times it was hard for me to slow down, relax, and appreciate the great music happening around me. So it was a real treat when we finally got down to the very last show of the festival on August 25th of last year, and I got to hear the Hamilton Dixieland All-Stars for the first time. Dixieland is one of the oldest styles of jazz music. Many people might not know the term, but once the band starts playing most will find the music instantly recognizable. It’s classic New-Orleans style jazz that evolved out of the blues, ragtime and brass bands, and spread all over the United States (and beyond) in no small part thanks to it’s most famous practitioner, Louis Armstrong. 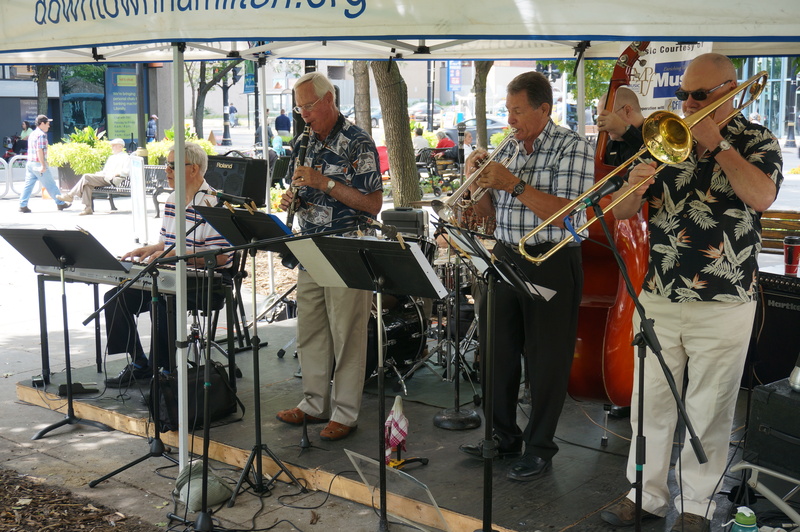 The Hamilton Dixieland All-Stars blew me away with their sound last year, and I knew I wanted to have them back again at this year’s Steel City Jazz Festival. The band is made up of some of the best musicians around Hamilton and the GTA, featuring Frank Musico on trumpet, Don Templeton on trombone, Don Hall on clarinet, Matt Kennedy on piano, Jimmy Howard on bass and Steve Wilson on drums. Together they’re bringing the raucous, joyful noise of New Orleans to Hamilton to open the Steel City Jazz Festival. I could go on trying to describe Dixieland or the All-Stars, but the best way to get acquainted with them is by listening. I caught the All-Stars’ last performance at the Gore Park Summer Promenade and took a few videos. The video quality leaves something to be desired, but the playing is top-notch, so I encourage you to give them a listen! You can catch the Hamilton Dixieland All-Stars on the opening night of the 2014 Steel City Jazz Festival on Wednesday, October 15th at Artword Artbar. Doors are at 7pm, the show will start around 8pm, and tickets are $15. Bring a friend, grab a beer, and shout out when you hear something you like! Previous Previous post: The 2014 poster is here!